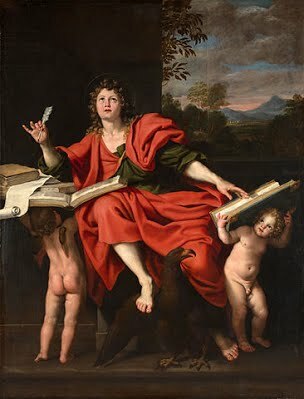 Saint John the Apostle and Evangelist – My Catholic Life! Saint Jerome, while living in Palestine in the late 300s, relates a touching anecdote still being told at that time about John the Evangelist. When John was old and feeble, Jerome recounts, and no longer able to walk or preach, he would be carried among the faithful in church and would say only one thing over and over again: “My little children, love one another.” Saint Polycarp, through Saint Irenaeus, tells us that Saint John’s long life ended peacefully in Ephesus about 100 A.D. John was the only Apostle not to die a martyr. John’s old age in Ephesus was a long way from where his life began on the shores of the Sea of Galilee. Young John was sitting in his boat mending his nets alongside his brother James when an enigmatic but straight-talking teacher who lived in nearby Capernaum (Mt 4:13) walked by. Jesus saw the brothers on the water and challenged them to follow Him and become fishers of men (Mt 4:21-22). John and his brother said “Yes.” Their immediate and generous response put them at the red hot center of a movement which would change the world. From that decisive moment onward, John was at Christ’s side in the quiet times and in the momentous times. Peter, James, and John were the select Three inside of the Twelve. John saw Christ transfigured on Mount Tabor and wondered at what it meant. He leaned against Jesus at the Last Supper and stood under His drooping body at the foot of the cross. John was the first to reach the empty tomb on the first Easter Sunday, though he deferred to age and authority and let Peter enter the tomb first. John sees the resurrected Jesus in the upper room and then back where it all began, at the Sea of Galilee. John perseveres despite persecution, even the religiously inspired murder of his brother. John likely accompanied the Virgin Mary to Ephesus, where both shared their memories and tender faith with the Christian community there over many years. John’s Gospel is stylistically distinct from those of Matthew, Mark, and Luke. He likely wrote it in his old age. Perhaps many calm years mellowed the Gospel’s tone, allowing John to draw out God’s pure love more than His fight. John’s Gospel, his letters, and his Book of Revelation soar. They offer a high theology of Christ, a supernatural, often mystical vision of Christ’s role in salvation. John is the Apostle who best conveys God’s love. It is a commonplace to say that God is love. It is also a commonplace to say that any further description of God complicates His simplicity and leads to argument, division, and violence. Yet the Christian attestation that God is love rests at the summit of a mountain of thought—complicated and nuanced theological and philosophical thought. The simplest thing we can say about God is tied to the most complex thing we can say about God. To say God is love implies a wealth of supportive truths. The harshness and apparent injustice of life does not naturally lead to the conclusion that God is love, and no one said that God was love before Christians said it. For many, God was, and is, a master, a warrior, a hero, an oak, a waterfall, or a sunrise. God was a growling earthquake, a mighty storm, a tidal wave that drowned the new colony. God took vengeance for sins and flooded the earth when the people disobeyed. He was like a hunter on the prowl, his bow arched with arrow ready to fly. Reading the history of man and experiencing daily life, it is in no way clear that God is love. We have to be told this. We have to see this. We have to experience this. And the Church tells us and shows us this constantly. That many people the world over instinctively think that God is love is a triumph of the Church and of Saint John the Evangelist. To say this and to think this is to break one’s lance against the brick wall of daily life. But it is also to say the truth, a received truth. God loves Himself in the Holy Trinity first, and then that loves radiates outward to all of us. Without knowing that, we cannot know the rest. Saint John the Evangelist, you wrote of God’s love for you, Christ’s Beloved Disciple. Through your intercession in heaven, inspire all writers and evangelists to convey God’s goodness and love, so that the entire world knows that there is one person, a divine person, who cares.